Greg used a well thought out combination of insulation upgrades and a solar space and water heating system to cut his space and water heating energy use of his all electric home to nearly zero. 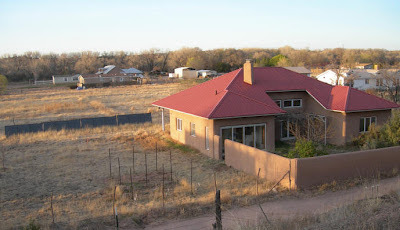 Greg's NM near net zero remodel -- collectors to left. The house has been foamed and then plastered over the entire exterior. This project shows that you can live within the limitations of an existing home and still make dramatic reductions in energy use within a reasonable budget. Greg did most of the work himself, and goes through the details of planning and installing the upgrades. The 2000 gallon heat storage tank stores heat for a couple days of cloudy weather. 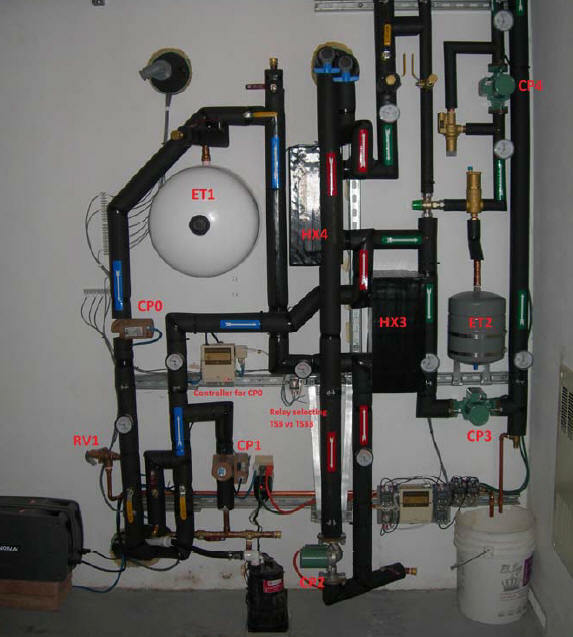 Greg used a balanced approach consisting upgrades to the home's thermal envelope to reduce heat loss, and then the addition of a solar heating system sized to meet the remaining heat loss. The thermal envelope upgrades consisted primarily of adding external foamed in place insulation, adding attic insulation, and thermal window treatments. These upgrades reduced the home heat loss to the point where a reasonable size solar heating system could heat the house. 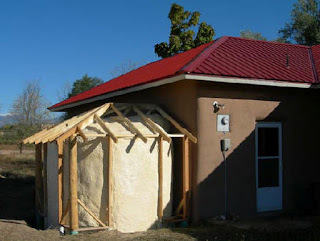 The solar heating system consists of four large ground mounted solar water heating collectors. The solar collectors provide heat to to a large and very well insulated fiberglass tank that is sized to store heat over cloudy periods. Both the collectors and tank have been carefully added in such a way as to preserve the good looks of the home. 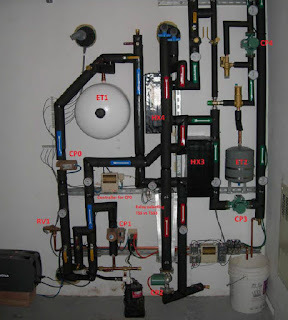 A hydronic heat distribution system was added to distribute the stored solar heat to the home as required. The hydronic systems replaces the electric baseboard units that came with the all electric house. 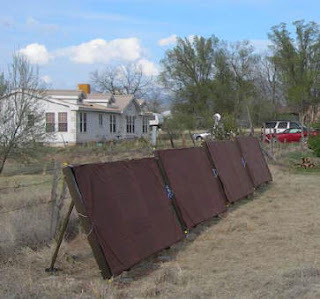 Four large solar water heating collectors provide space and water heating. With the insulation and solar heating upgrades, the home is now totally self sufficient on space heating and water heating energy use. Greg plans to add a PV array on the roof to meet the remaining small electrical demand. When the PV array is completed, the house will be a net zero energy home. Net zero energy use is very difficult to achieve even for new construction homes, so it says a lot about Greg's design that he was able to achieve this zero energy use on a remodel and within a reasonable budget. Thanks very much to Greg for taking the time to document and send in the project! 2000gallons/192sqft == ~10.42 ratio which is really high compared to the rules of thumb. For me this is the highest ratio I have seen for a thermal storage(liquid) to surface area. And it seems to work well at least for his personal conditions. Well insulated house and particular climate. I knew it was a big storage tank compared with rules of thumb, but at the time I thought it made sense in my special circumstances, which included constraints on what would fit in the living room/kitchen and master b.r. for hydronic-to-living-space heat transfer. In the dead of winter, I calculated that I'd need 120 deg F min hydronic temperature to get enough heat into the house; thus about 125 deg F minimum storage-tank temperature (there is a brazed-plate heat exchanger between those two, thus a few deg F difference when trying to move a lot of heat). If I had been starting from a traditionally built hydronic tube-in-floor setup in my house, that estimate might have ended up 110, 115 deg F instead of 120, 125; keeping a storage-tank max around 155 to 160, I'd have dropped my storage tank volume from 2000 to 1500 gallons and had the same heat-storage capacity [i.e., 1500 times (155 minus 115) = 2000 times (155 minus 125) ]. I have a LABEL on the right sidebar for Solar In New Mexico. I look forward to following your work. Hi -- The blog is mostly used to announce new content on www.BuildItSolar.com, so be sure to have a look there as well.